An amazing showroom located in high traffic area with exposure to 60k plus cars per day in a very well exposed retail shopping center. Immediate area has a high net worth population of older homes fully engaged in the remodeling cycle. The showroom is renovated and up to date on the latest styles and colors. Two long term, solid sales/design employees plan to remain with the business upon the owner retiring. 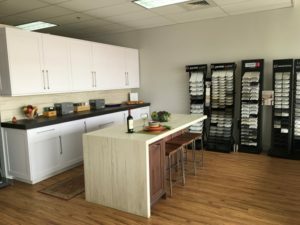 The company has long standing relationships with multiple cabinet, countertop and appliance suppliers. A new owner can be confident that the suppliers have a vested interest in the future success of the company going forward after the purchase. The current owner’s responsibilities include management oversight, finance, banking, planning, accounting and a minor bit of sales and design. Custom builders, remodelers, flippers and DIY are amongst its clientele. Many established relationships go back a decade or more, which has been the secret to their success regardless of market conditions. The Company has a high rate of repeat business as well as referrals. The business and the day to day operational systems have been designed to be simple and intuitive to use for a new owner. This turnkey sale includes all of the day to day equipment required for operations including computers, servers, CAD software, plotters, printers, multiple work stations as well as established vendor relationships for banking, taxes, hardware suppliers, etc. A financially savvy, detail and customer service oriented buyer with a focus on marketing and advertising will be positioned to take advantage of growth opportunities. Imagine the potential that awaits you on the purchase of this well-established turnkey business with a proven track record of success. There is tremendous opportunity for a new owner of an exceptional, 28 year old company.